Custom Hand-Painted Portrait From Your Photo By Real Artists. The Best Pet Loss Memorial Gift! Our pets inevitably become members of our family--so it’s no wonder their passing can be so difficult. Often, the best way to deal with the grief of a loss of a pet is to celebrate what your cat or dog meant to you. 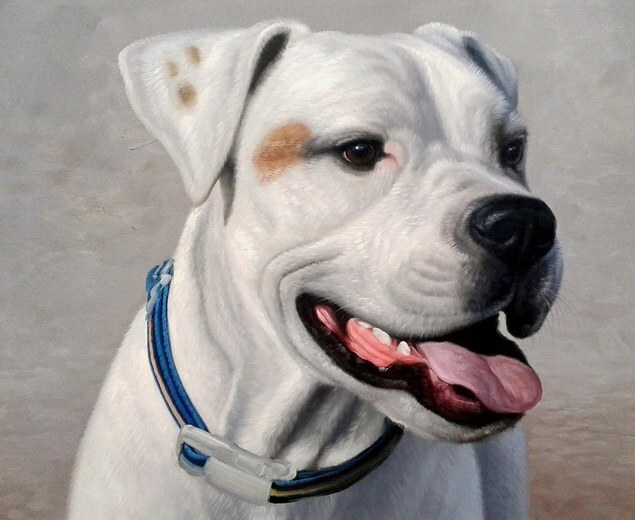 A hand-painted pet memorial portrait is one of the best ways to cherish and memorialize a pet. Simply select a medium and a photo of a beloved pet, and you’ll have the perfect timeless pet memorial gift for a loved one (or yourself!) that will evoke the good times shared with a furry loved one. 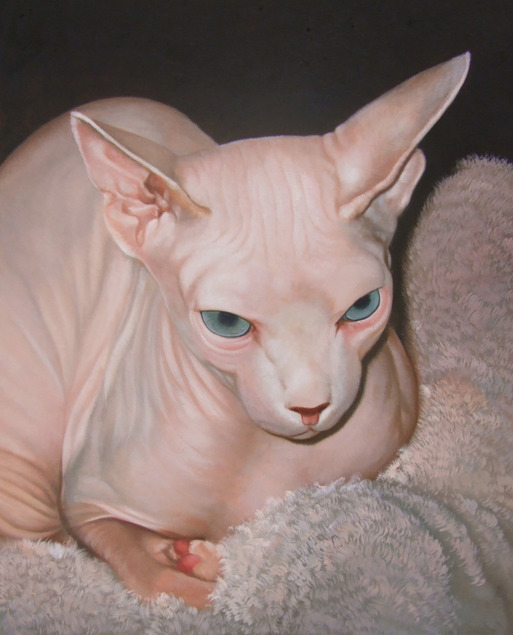 "We were very pleased with the oil painting of our beloved hairless cat! He passed away suddenly of a heart condition at only 4 years of age. The painting is so beautiful and is a wonderful tribute to him and his life. I have already recommended you to friends and family. " "We just love the painting of our special little Rangers fan! It was the perfect gift for my boyfriend`s birthday! " "My son and his fiance absolutely loved their Christmas gift! It`ll be the first thing they hang once they get a house of their own. Working with the artist was so easy. She did an awesome job of capturing Thor! " "I ordered this as gifts for my daughters for christmas. 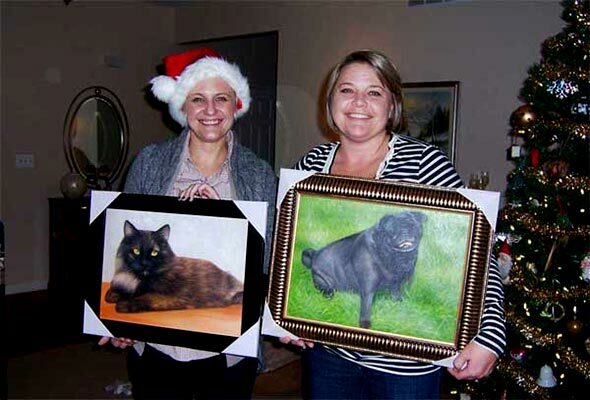 Their pets were painted so beautifully and it was great to see them opening it! " Rated 4.9 out of 5 based on 334 reviews. Excellent work, people cannot believe it was done from a photograph. We are very pleased and would use this Company again without hesitation. So impressed with the painting and my husband loved it. It is a wonderful remembrance of our beloved pup whom we all miss dearly. There are no words to express the beauty of the final portrait. Will definitely use again. When I opened my package I started to cry. The painting caught Isabella's true character and brought her back to us. I cannot thank the artist enough for such a beautiful piece of art. Incredible painting of our late pet !! 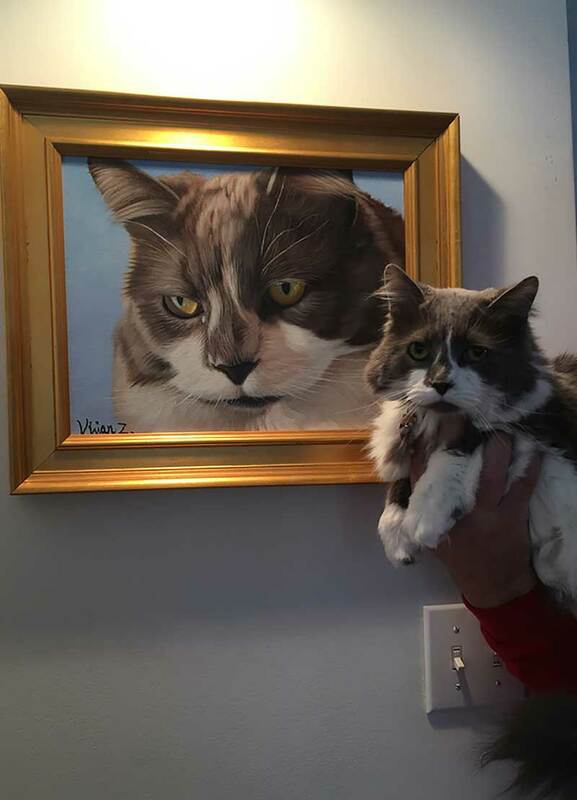 The likeness of the painting to the photo is just remarkable! It’s a beautiful rendition on our fur boy who passed away last year. A painting we will treasure. The painting turned out great. Everyone was happy to take care of my requested changes. My son was very happy with the results. Thank you. I love my picture of Sparky! Brings back fond memories! Totally real and wonderful to view! I would highly recommend to everyone. Thank you for the great gift and the talented artist is wonderful! Amazing painting. Will absolutely use service again! I was very satisfied with the entire experience. The artist was obviously a professional, because the painting was perfect. I would get detailed emails letting me know the progress of my painting and when to expect it. Will definitely be buying any future paintings from this company. Outstanding...the detail was perfect. it is a mirror image of the photo. The process was easy really once I found the right picture. Everything went as stated and was clearly explained. Absolutely blown away by the painting. The artist was Kate or Kay. Great job guys! The likeness that the artist was able to capture from the picture sent was to the point!!! The painting was for my brother who lost a loyal companion in and outside the house. They had 13 plus years of love, exercise and joy together. I knew Cody’s time was coming and had been thinking of a portrait for the past year. PaintYourLife and the artist Melissa provided a portrait that brought my brother to tears when he saw it. It’s the perfect way to memorialize a cherished moment in time. Turnaround on the portrait being delivered to his door was short and Cody’s presence still fresh. Thanks. Great gift for a loved one! Unique. The staff did a great job sending updates along the way and making sure it was to my liking. 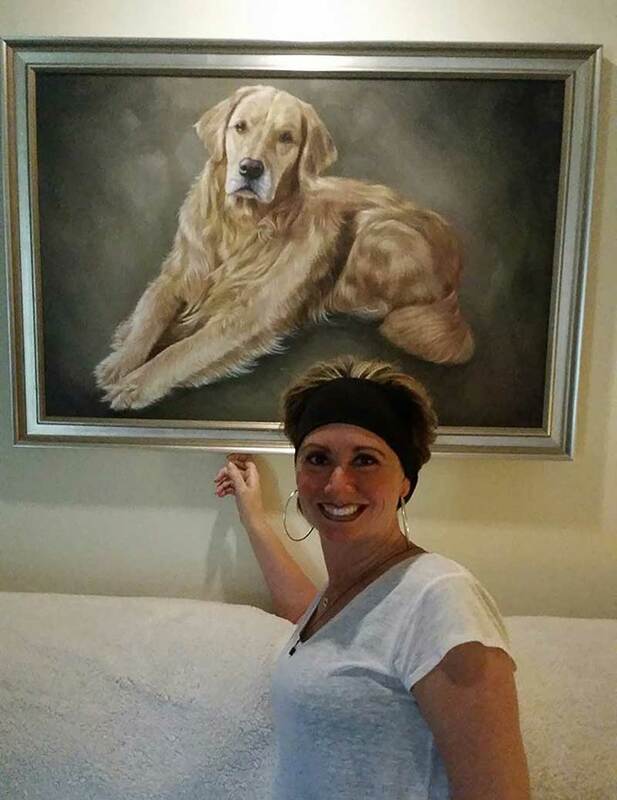 Beautiful portrait of sister and her husband dog Yetta. You have amazing artist. Thank you Thank you. We were very pleased with our oil painting. The painting captures our boy perfectly and the frame complimented the painting nicely - a great package. Hubby said it was the BEST gift EVER! The artist did an excellent job!! Painting was done before expected date of finish. The eyes were brought to life. My expectations were exceeded. It’s almost as if she could jump off the canvas into our arms. Loos just like her in real life. This was a great value. Best customer service and care and amazing artistry from your heart to the recipients. Painting turned out wonderful. I have already recommended this company and the painter that did my painting to friends. I was very pleased our painting. Looked just like our beloved dog. 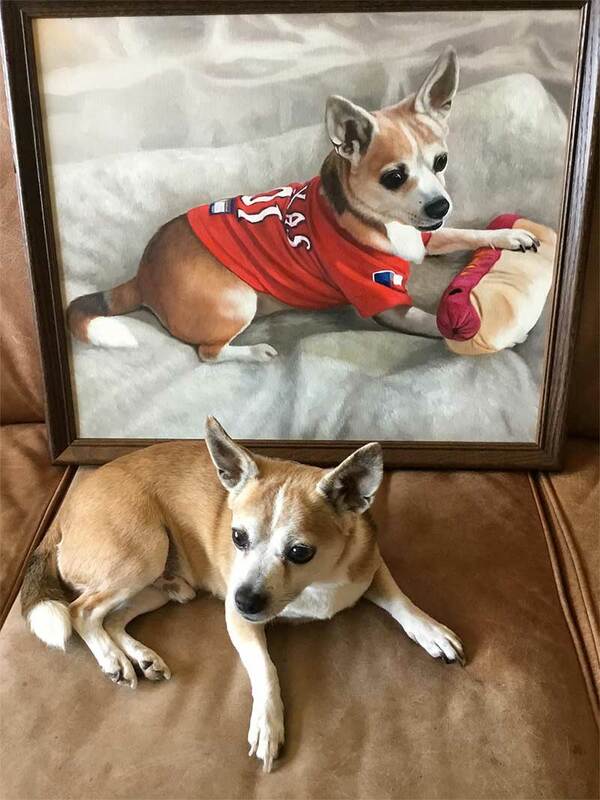 Amazed at the quality of the oil painting of my dog, Cecil! The artist beautifully captured the spirit of our beloved Zach who passed February 10, 2017. I compared this company’s price with many others...worth every penny. Beautifully done. Will be ordering again. First off, the painting is beautiful. I was skeptical. The product is a bit pricey. Now I understand why. It’s not just a copied photo. 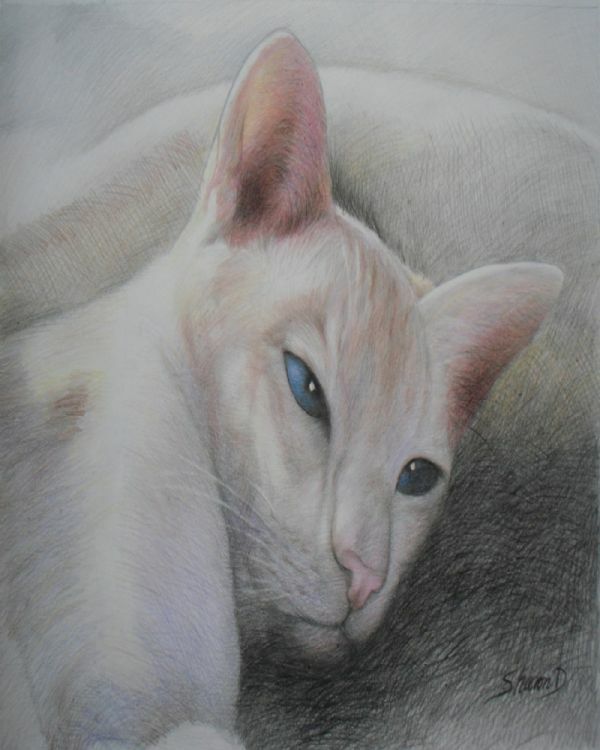 The artist captured the attitude and beauty of our cat. I would highly recommend. Amazing and touching, real life depiction of my beloved lost pet. The artist checked in with me every step of the way and I felt like she really cared that I got just what I envisioned. Service, product, everything was outstanding. I’d do this again in a heartbeat. My painting is so lifelike of my german shepherd. I have recieved so many compliments.. Highly recommend. This turned out beautiful! 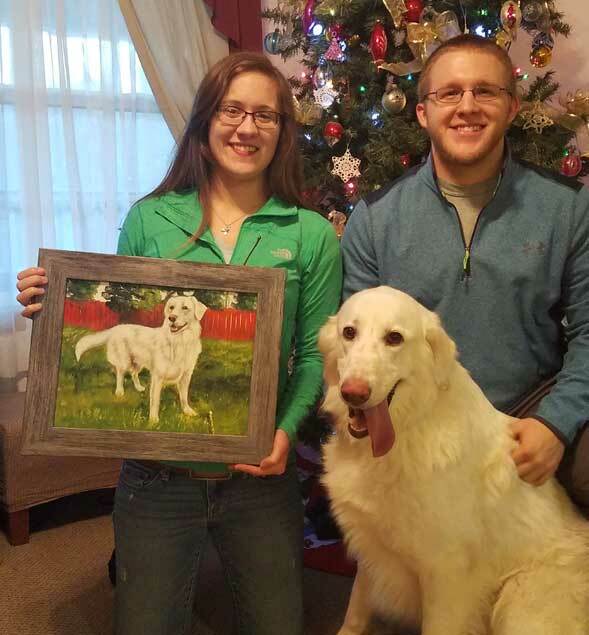 The painting of our puppy Oakley was a Christmas gift. It was such a beautiful portrayal. The quality and artists eye for detail was second to none. We believe the painting is even better than the photo! 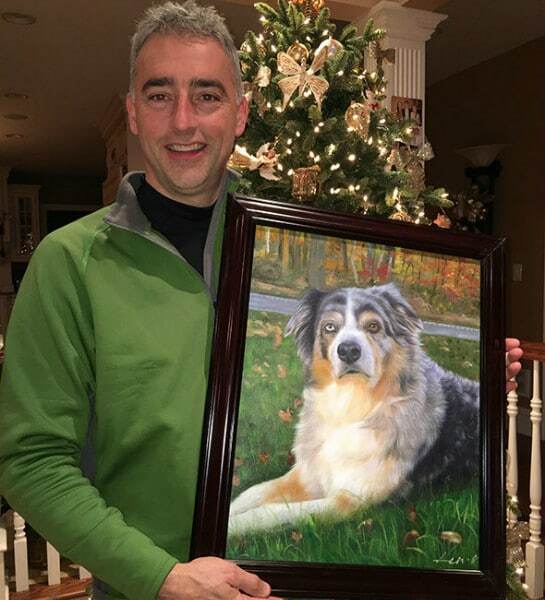 Thank you for painting an absolutely perfect Christmas gift. My wife is very picky as far as what she would put on her wall but Christmas morning she absolutely loved the painting! 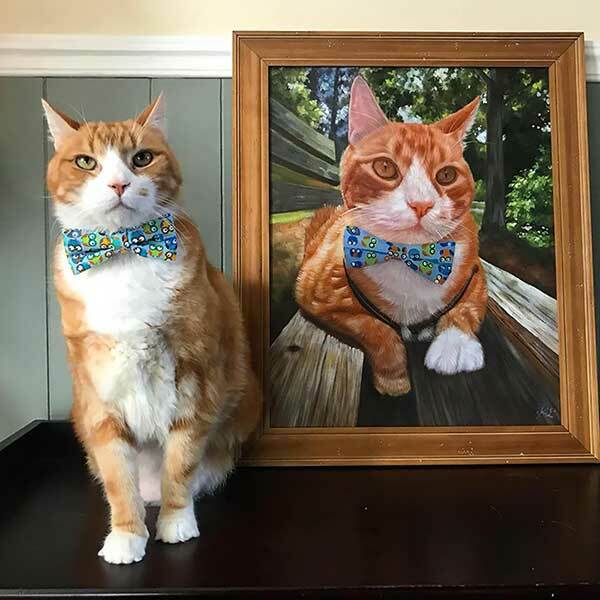 We ordered two paintings of our cat (one for each daughter). Both paintings were done beautifully! I have recommended paintyourlife.com to co workers, friends and family!! Do not hesitate to have a portrait done. I had no idea of this company. Looked on line to find someone to do a painting of my daughter's 6 month old puppy who died suddenly. We were all heart broken. What an amazing and life like portrait was done from the photo I submitted. I was nervous to have this done and be right. Zeus died beginning of Nov and I wanted this for then for Christmas. What an amazing gift for my daughter, son in law and 3 kids to now have there amazing puppy with them forever. I could not of asked for more from the artist. Came out beautifully! Love it! 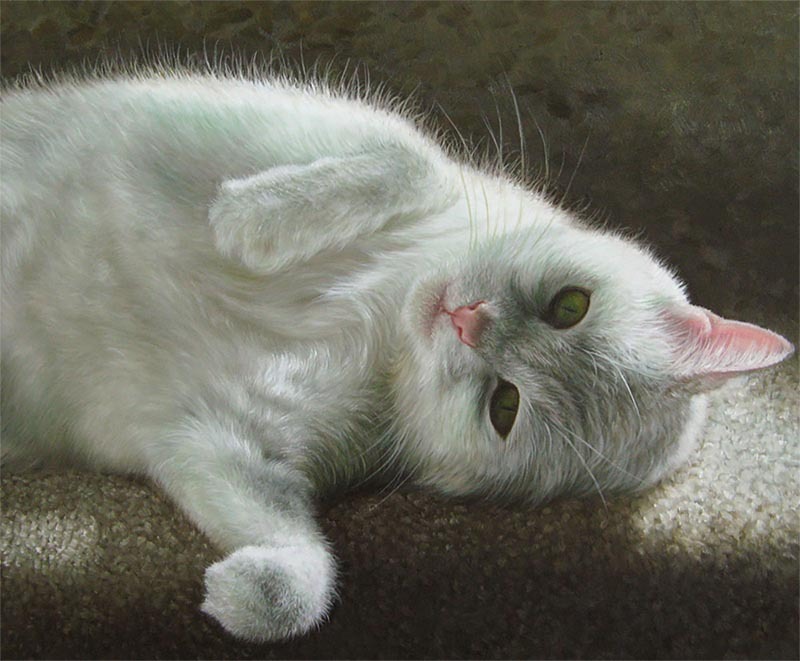 Beautiful painting of our recently deceased cat. Delivered in time for Christmas. Can't say enough about the PaintYourLife team. Great painting....very life like and artistic. Would highly recommend to all! Very personalized portraits well worth the money. They will capture the essence of your beloved fur baby. I high recommend “Painy Your Life” for any important moments you would like captured! The painting I received exceeded my expectations. I will be using this service again. Easy and high quality. Capturing the essence of an animal in their eyes and face is crucial to preserve their memory. Great painting!! Fabulous customer service!! Couldn’t be happier!! The hoped for/desired effect was reached! When my husband opened his Christmas gift he immediately dissolved into tears. Mission accomplished! Thank you so much paint your life team! What a great discovery. Now our Chico will be beautifully honored on the wall of our home. The oil portrait of our dog is very good and captured her so well from the picture. Loved it! We love our painting! It was done quickly and the artist really worked with us to get it exactly the way we wanted it. I absolutely love both paintings and have gotten rave reviews from everyone who has seen them. We couldn't be happy with the oil painting of our dachshund. She won't be around forever but this painting will. Amazing detail in the painting. Packaging protected the painting very well. We lost our sweet Puggle, Frankie in October to a freak accident. I was completely devastated. 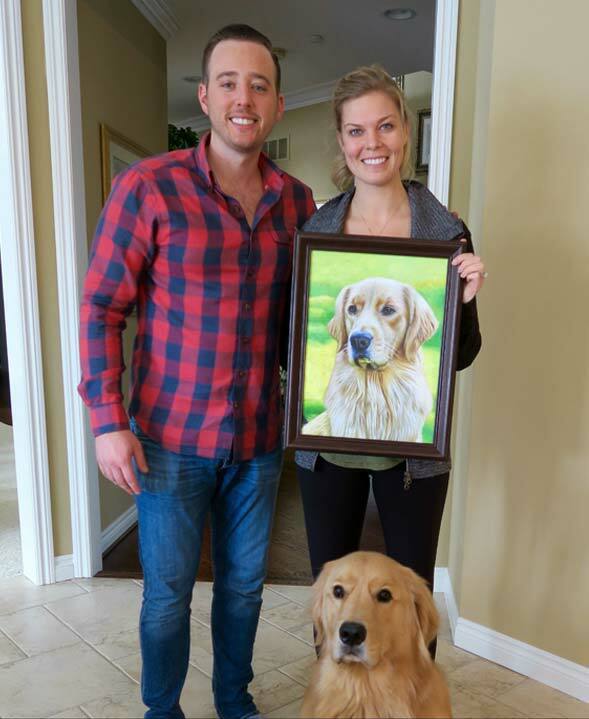 My niece lost her dog last year and her husband had his portrait painted for her birthday. I wanted a portrait of our sweet girl so I chose Melissa as the artist. She did an awesome job. The painting looks exactly like the picture. I was very impressed. I’ve told many people about our experience. We are very pleased with how the painting turned out and how quick it was completed and sent to us. It was a very easy process and we will use this company and artist again at some point. It was a real shock to take that first look at the painting of Annie, my in-laws late, beloved dog. I just couldn't believe how well the artist conveyed Annie's personality with only one photo to work from. I was actually moved to tears. This painting is a gift for my in-laws for Christmas and I know that they are going to be as moved as I was. My daughter said that she thinks that this will be the best gift that we have ever given to them. My daughter had this company paint a portrait of my dog who passed away this June as a remembrance of her. When the picture arrived, and when I opened the box, I cried so hard because it looked just like her. So I ordered another painting of my other dog from 1997, and mailed a picture of her so they could paint it. It was the most beautiful picture of her. I put both paintings next to each other, so when I sit in my den, I can look at both dogs. (and cry). The memories from these pictures just make me so emotional. If you are thinking of having a portrait done, a person, animal, or anything. Don't hesitate. These people know how to paint. Amazing!! The portraits are incredible. I have had three portraits of my dogs done and people that have seen them, have thought it was a photograph at first. They are that good!!! I will have more portraits done in the future. Loved my painting, looked just like our lovely Franklin. Great painting! Will highly recommend. Fantastic, true to life rendition of a beloved animal and indicates great skill on the part of the artist. I submitted a photo of my son's pet Yellow Labrador. 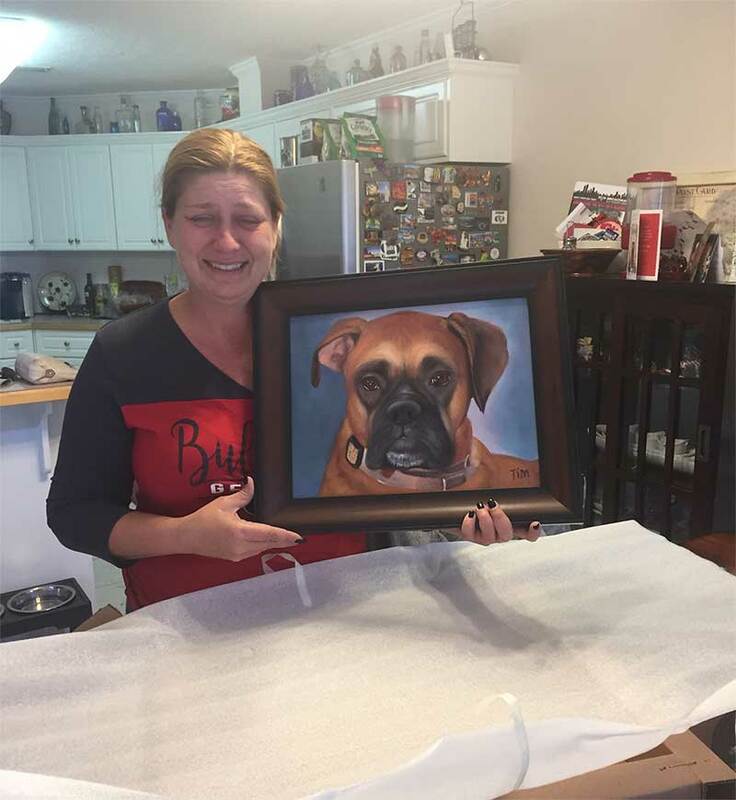 The result was a beautiful painting that captures the dog's spirit perfectly. It will look beautiful on his office wall! Thank you to "Paint Your Life" for helping me with this wonderful, unique gift! Kate who painted my border collie Lacey did extremely good job getting all the details on the painting.